The unknown can be a beautiful thing. Being confronted with the prospect of a trip to a city you don’t know, where they speak a language you don’t know, all to attend a festival of artists who, for the most part, you don’t know, can be a terrifying prospect: and yet, it is for precisely these reasons that Rio de Janeiro’s Novas Frequencias was so fascinating. In its sixth incarnation, spread across a variety of the sweltering city’s underground venues, the left-field festival glimmered with intriguing and thrilling performances from acts both local and from further afield: notably, a large contingent from Europe, as part of the SHAPE platform. For organiser Chico Dub, the main rule of curation is that artists at Novas Frequencias should be doing something different – and given that on the first day, Andreas Trobollowitsch’s performance entailed chopping wood, the surreal breadth of art on showcase was certainly apparent. Bigger names like Xiu Xiu were predictably striking and almost operatic, but just as impressive were those moments that came from unexpected places: from the chiaroscuro theatrics of Julian Desprez, the techno-tinged noise of CÉH, the meditative strokes from Sis_Mic, the absurdist quasi-comedy of Interregno Trio through to the sleazy beats of Mr Mitch; there was truly a wealth of captivating performances. Beyond those mentioned, in no particular order, below is a selection of ten of the best performances Novas Frequencias had to offer. A band from São Paulo who make psych-y garage that borders on gothic, these ladies know how to create a spooky, captivating atmosphere that seems to draw people in. Spacey, immersive percussion, a dark, dissonant edge and a discernible vitality to it all: this is very impressive music. Check out more of their music via Bandcamp. For a gig that takes place in the back room of a local recording studio - Audio Rebel - it is remarkable how immediately impactful this set is. Dissonantes are a collective of women from São Paulo (some of whom make up the aforementioned Rakta). Their raison d’être is to increase female involvement in the experimental music scene, and this show is cosmic. Maybe it’s the hotbox atmosphere, maybe it’s the way the lighting bathes them like they’re twinkling holograms, or maybe it’s the disconcerting, whirring drone of music; whatever it is, it keeps people glued there for the hour or so of their sublime performance. Follow them via Facebook. 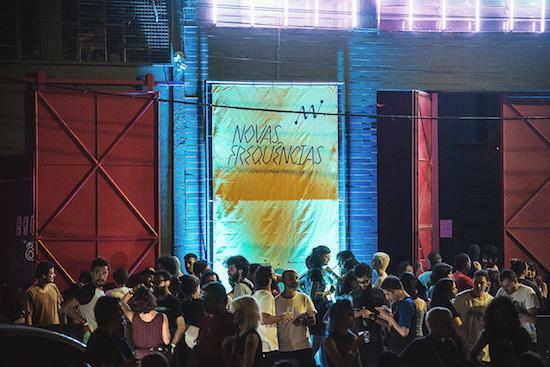 The meditative Lebanese producer formerly known as Morphosis is on the bill twice at Novas Frequencias: once, soundtracking a short, anthropological film by Vincent Moon and Priscilla Telmon, and the second time closing the festival with a solo set. The former seamlessly complements the almost voyeuristic snapshots of rituals, while during the latter, Beaini shows a real proclivity for thrilling, intricate dance music that draws on sounds from around the world. 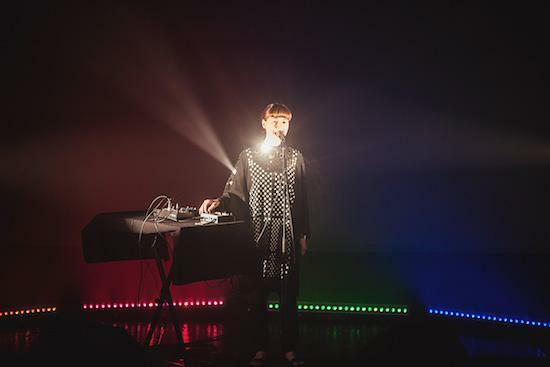 Putting the crowd in an odd ecstasy, the Norwegian, Berlin-based artist takes vocals into gorgeous untrodden frontiers in her ‘Fake Synthetic Music’ performance. The video doesn’t do the experience justice – a cascade of rainbow lights, a mirrored outfit that beams out reflections like she’s a live disco ball, all while she sways, siren-like, yelping her delayed layers of hypnotic soprano that swirl high frequency acoustics in your ears. Motland’s performance is a genuinely stunning reminder of the possibilities of the human voice. Find out more about her here. 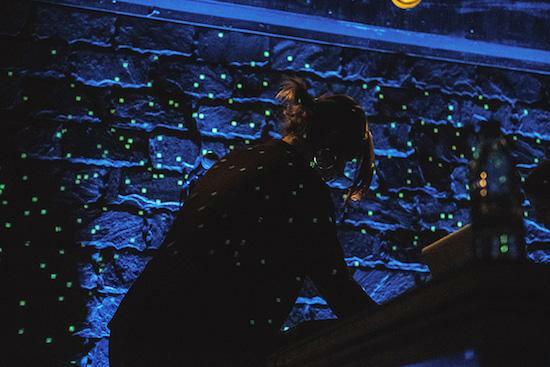 This Berlin-based Lithuanian makes music that is at once intense and violent enough for the club, yet somehow trancelike and deliciously immersive. There are no obvious beats here - no repetitive, fast-paced rhythms to dance to - and yet there’s a theatricality to it that draws you in, and somehow works perfectly with the glitchy strobes and the excitable closing night atmosphere. A man from São Paulo says he has stayed up all night and come straight to Rio, solely so he can see Elysia Crampton two nights in a row. He is every bit as smitten this time around: rightful queen of the queer scene, Crampton puts on a goddamn exquisite show. The American-Bolivian is a rapturous mess of chaotic hair, imploring speeches, gloriously imposing beats and juddering synths as she practically throws herself around on stage. At one point she mixes in that riff from ‘Let Me Blow Ya Mind’, and it’s incredible. There’s something about this performance from Berlin-based Portuguese artist Gil Delindro that immediately recalls an ominous science experiment. In ‘Voidness of Touch’, Delindro has rocks, a bowl of water, a block of ice, and the constant crackle of electronic noise serving as an undercurrent to it all. It’s fascinating and strangely visceral watching him build up sounds out of natural objects - particularly as the ice simmers and melts to reveal the microphone within it. At one point he lowers his head into the bowl of water and sings in a drone, and the whole thing feels almost like some kind of religious ritual. Check out his website. In spite of the grave misfortune of his seat being distractingly creaky, there’s no doubting the talent of Lancaster’s Stephen Grew. Intricate flourishes of strange piano melodies seem to pour out of him, and it’s magnificent to watch the frantic energy that pervades his performance as his hands dance over the keys and pull at the piano’s strings. His sound doesn’t feel entirely of this time, but that’s in no way a bad thing: this is an accomplished, quite beautiful performance that shows experimentation doesn’t have to be all brash electronics to be affecting. Find more via his website. Black Zone Myth Chant (a project of French producer High Wolf) makes the kind of dark, psych-y electronic music that bubbles with an uncomfortable warmth befitting of the humid rooftop he’s playing on. Unfortunately a storm starts midway through his set and cuts things short, but before this the producer establishes an intriguing blend of sounds: beats that sometimes recall codeine-era hip hop and sometimes afro-infused polyrhythms; distorted, barely-there vocals and sparkles of electronics that are somehow at once tropical and disturbing. Find more via his Bandcamp page. The concept of a DJ whose set included “club”-style mixes of Red Hot Chilli Peppers and Avril Lavigne shouldn’t work – and perhaps, more to the point, it maybe shouldn’t make a tQ top ten list. However, the throngs of people legitimately jumping in the air prove that Pininga knows his crowd (and his crowd love a baffling EDM version of ‘Complicated’). His enticing blends of house, dancehall and sometimes even grime-y sounds with local vibes like tecnobrega, baile funk and maracatu are incredibly fun, and very much show that Brazilians know how to have a good time. There's more from him on Soundcloud.